Kentucky’s Red River Gorge is a giant sandstone layer cake hollowed out by water and covered in life. On its ridges and slopes grow the mixed hardwoods of the eastern U.S.—oaks, maples, tulip poplars—along with hardy pines, mountain laurels, and an occasional bigleaf magnolia. 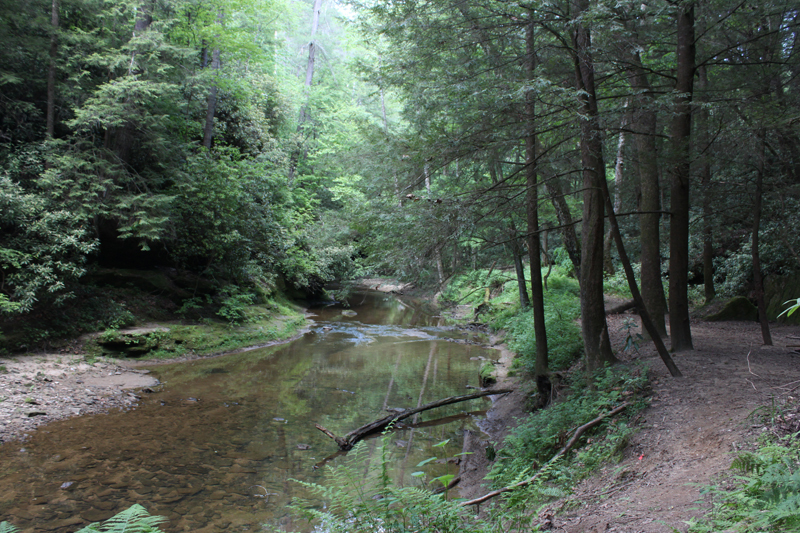 But in the Gorge’s stream-carved ravines, plants from a colder time still find a home. Descend into one of these valleys on a hot summer day and you may find yourself suddenly wrapped in a cave’s chilly breath and a hemlock grove’s dusky shade. Since before I can remember, I have been hiking the Gorge. As a child, a hike was pure bounding adventure, and it was only thanks to the adults that we eventually settled down in some beautiful spot to eat our sandwiches. As a teenager with friends, a hike was freedom, a chance to expand from our city selves. We would lace our boots and set out full of spirit and chatter, eager to rack up miles, scramble up boulder piles, run full speed down slopes in the rain yelling. We gazed up at the huge cliffs and arches and allowed ourselves to be awed. But of the millions of trees we passed on these hikes, I don’t think we even stopped to look at one. We were too restless, too hungry for challenge and too in thrall to the grandeur of rock. If we had paused for a moment in a quiet valley, we might have seen the hemlocks full of life. We might have enjoyed their light green fringes of new growth, and felt their downy needles. 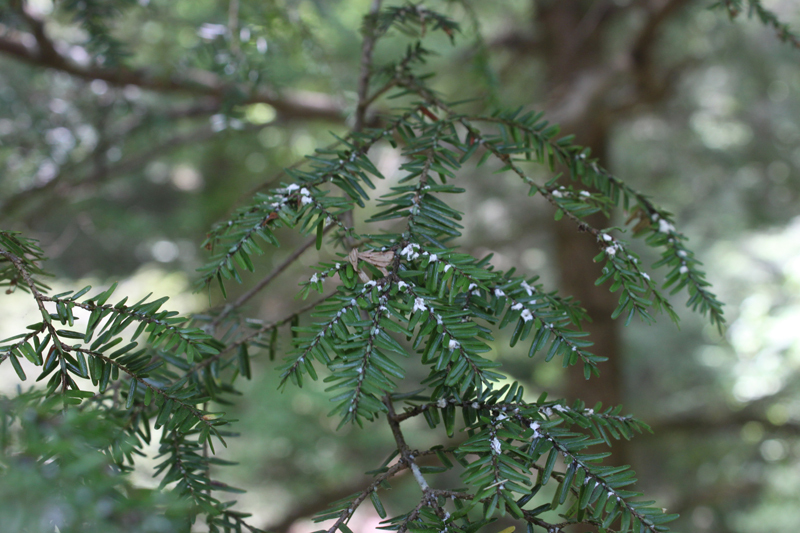 In Kentucky, the eastern hemlock is one of those species left over from a colder time. As the last ice age ended and glaciers receded poleward, trees and other plants moved across the landscape, tracking their ideal climates. The hemlock, perhaps a slower migrater than most trees, eventually found its way to the understories of cool Appalachian river valleys. As it grew, its thick needles, which fan out in dense, overlapping branches, cast a shade so deep that few other species could grow in it. Thus the hemlock created its own preferred conditions, and perpetuated itself in its new home. 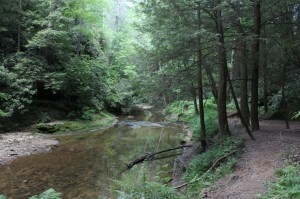 As the hemlock grew on the banks of streams, its perpetual shade also cooled the flowing water. 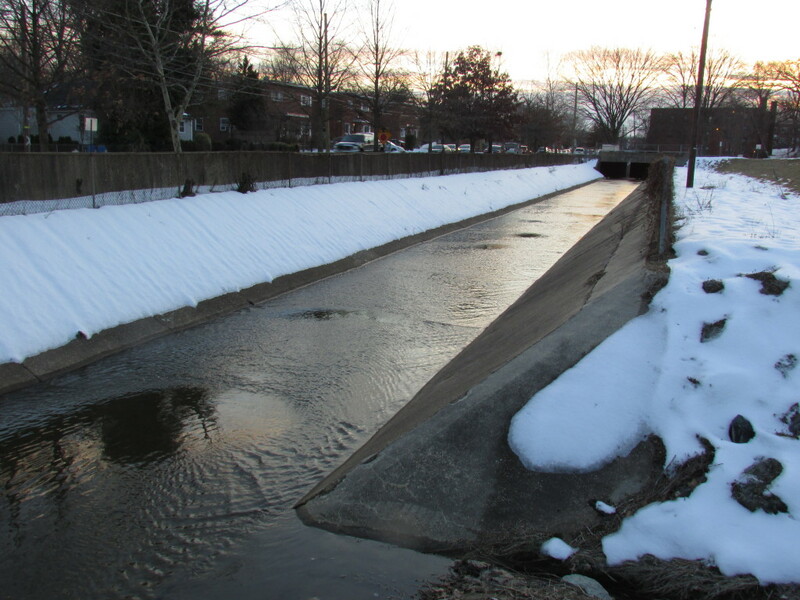 Trout, dace, and salamanders thrived. The trees dropped needles into the streams, and stoneflies arrived to eat them. Spiders arrived to eat the stoneflies. 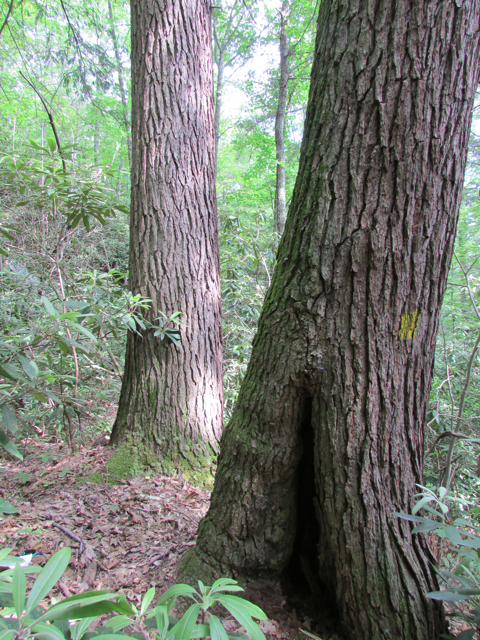 Over time, a community of life grew up around the hemlock. Ecologists call it a keystone species. 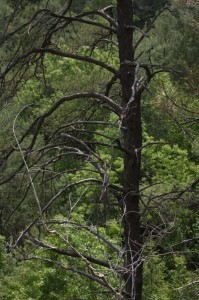 Today, I offer a lament for the Red River Gorge hemlocks, which shaded my childhood hikes without my knowing it. They shade less now because their lower branches are mostly bare. In a few years they may not shade at all. A tiny insect is extracting these trees one by one from the forest. The hemlock’s struggle is, on one level, simply biology. But it is biology made tragedy by our careless shuttling of species around the globe. The eastern hemlock has cousins in Asia and the West Coast, separated by eons of evolution. 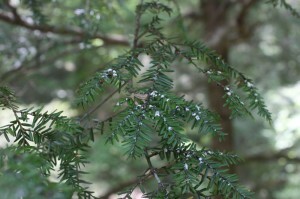 In that time, a sucking insect called the hemlock woolly adelgid evolved to live on the Asian hemlocks’ sap. Various predatory beetles evolved to eat the adelgid, and the ecosystem maintained a kind of dynamic balance. So it went for countless millennia; so it still goes for the hemlocks of China and Japan. But in 1951, a shipment of ornamental Japanese hemlock carrying adelgids arrived at a nursery in Richmond, Virginia. Soon thereafter, an insect and a tree that had never met were united, and by an unfortunate quirk of biology, the eastern hemlock proved both edible and defenseless. The adelgids pierce the sap conduits at the base of the hemlock’s needles, and the tree starves to death. The adelgid also proved to be an almost ideal invader. A female adult can, without even mating, lay up to 300 eggs at a time, and the insect has two generations in a year. 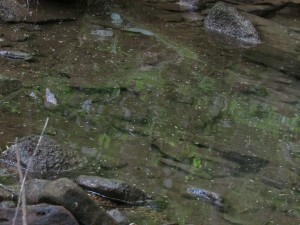 The tiny nymphs don’t fly, but they are easily given wing by wind or birds. 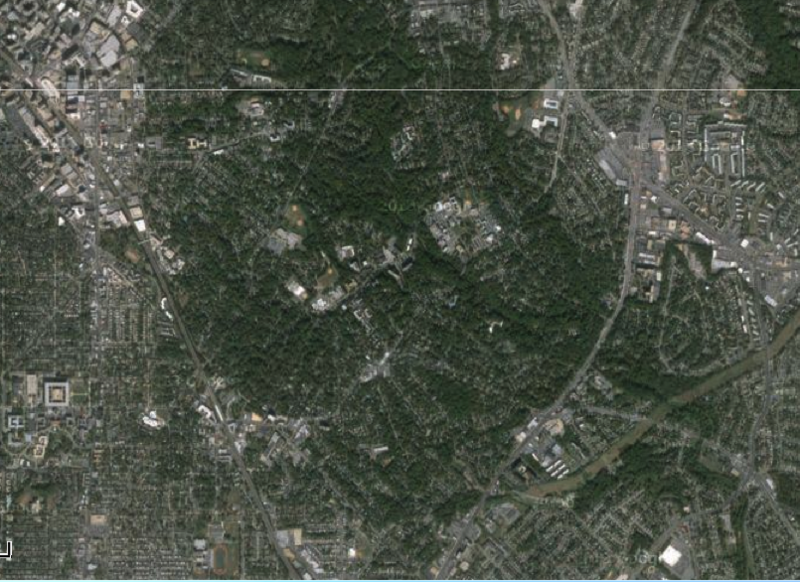 Nevertheless, the adelgid did not immediately sweep across the eastern forest. For several decades it spread slowly, perhaps as it evolved ways to better exploit the vast resources in its new and predatorless environment. In the 1980s, a hurricane that swept adelgids from Virginia up to Long Island and Connecticut seems to have triggered a faster expansion. Since then the bug has been spreading north, south, and west at up to 15 miles per year, devastating hemlock stands from Georgia to Maine. The hemlock woolly adelgid is a relative newcomer to Kentucky; it was first found in the far southeastern part of the state in 2006. Now it occupies about a fifth of the state’s counties, including Powell, Wolfe, and Menifee, where the Red River carved its gorge. On trees where the adelgid has taken up residence, the lower branches go first, but the insect can take several years to reach the higher ones. 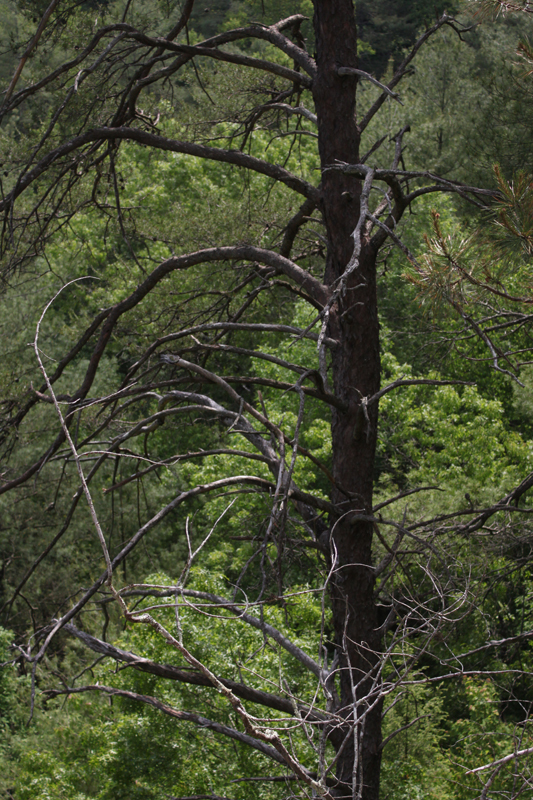 It may not be too late for Kentucky’s hemlocks—but they need help, and fast. 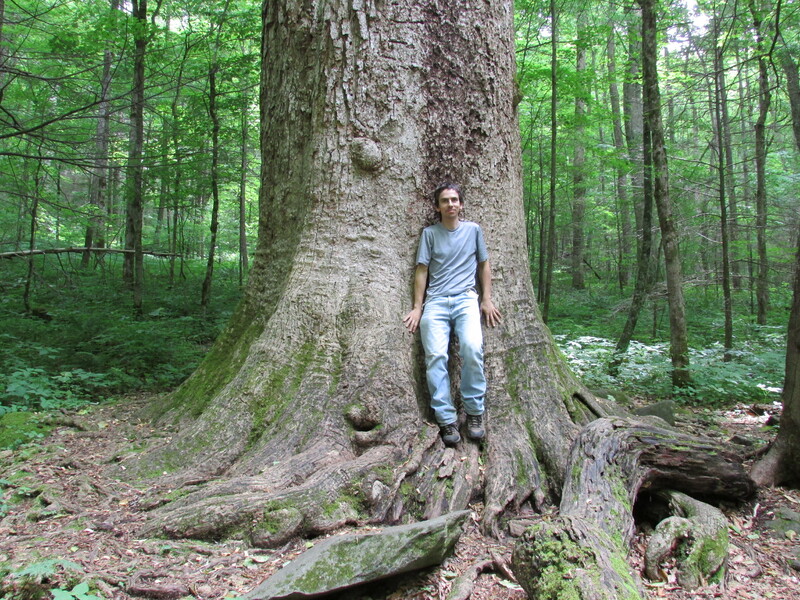 Scientists have found two ways to protect hemlocks. One is to inject or drench trees in an insecticide like imidacloprid (the same class of chemical implicated in honeybee colony collapse disorder) every few years. This method has the obvious drawback that it introduces a dangerous pesticide into a potentially vulnerable ecosystem. It’s also far too expensive to save even a sizable fraction of the trees in a forest. But it can temporarily preserve trees deemed particularly valuable for aesthetic or ecological reasons. Most forest managers believe only long-term solution to the hemlock woolly adelgid invasion is to replicate the natural systems that keep the insect in check in its native Asia. That means establishing populations of adelgid predators—a process known as biocontrol. Throughout the east, scientists are breeding, screening, and releasing several different species of predatory beetles in places with heavy adelgid outbreaks. Ironically, getting a desirable exotic species to take hold in a new area can be a real challenge. 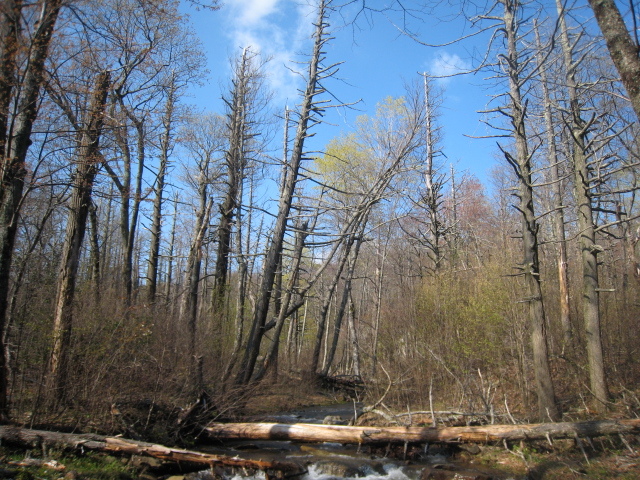 And in the South, where warm winters allow the adelgid to spread faster and more virulently than further north, trees are often too far gone by the time beetles build up enough population to make a dent in the bug’s numbers. 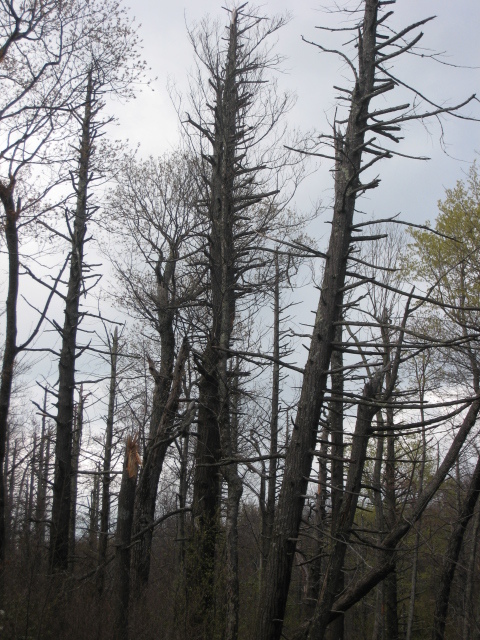 Biocontrol may not be able to stop the adelgid invasion, but it will be a critical piece of any future efforts to restore hemlocks to the eastern U.S.
Kentucky foresters and scientists can at least piggyback on the experiences of states where the adelgid hit earlier. But these places tell a mostly sorry tale. Despite millions of dollars and many smart scientists devoted to saving the mighty hemlocks of North Carolina, the trees there have mostly succumbed. In the valleys of the Great Smoky Mountains, grey skeletons line the riverbanks. In Joyce Kilmer Memorial Forest, a rare remnant of eastern old-growth, giant leafless trunks point skyward as mushrooms pock their decaying bark. 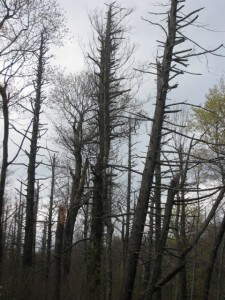 Forest managers even took the extraordinary step of felling some of the dead trees with dynamite so they would not endanger hikers. Sadly, a similar story is now playing out in Kentucky. And because it lacks world-famous sites like the Smokies and Joyce Kilmer to focus public attention and donations, the state seems to have far fewer resources to devote to its trees. As far as I can tell, only one Kentucky state employee works full-time on the hemlock. Forest managers are forced to triage, directing limited insecticide and biocontrol budgets to save select populations along streams or in heavily visited areas. And scientists doing adelgid research are stretched thin. Of those scientists, University of Kentucky forest entomologist Lynne Rieske-Kinney probably spends the most time on the insect. She has studied a variety of questions: what stream insects depend on hemlock; why are some hemlocks more resistant to the adelgid than others; what will happen to Kentucky forests if the hemlock disappears? Nevertheless, she told me the adelgid accounts for only a little more than a quarter of her research effort. It’s impossible to know whether Kentucky, with more money, could be the place where the hemlock makes a stand. But it does seem clear that without more resources and greater public urgency, most of the state’s 70 million-plus hemlocks will soon be lost. I admit I’m a latecomer to the hemlock’s fan club. I learned of the adelgid less than two years ago, from scientists in Wisconsin who worry that warming winters will allow the adelgid to reach their magnificent forests (for now, cold winters limit the insect’s northern expansion). Since then, I have seen too many hemlock graveyards—in North Carolina, in Georgia, in Virginia and Maryland, where I now live. 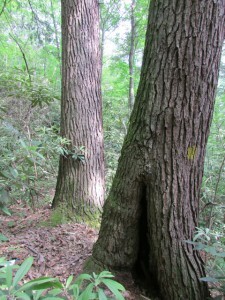 I have also hiked among the gorgeous, still living hemlocks of Red River Gorge and Blanton Forest in eastern Kentucky. I have felt their cool shade on a hot June day. I don’t want to come back to Kentucky in a few years and find more graveyards. 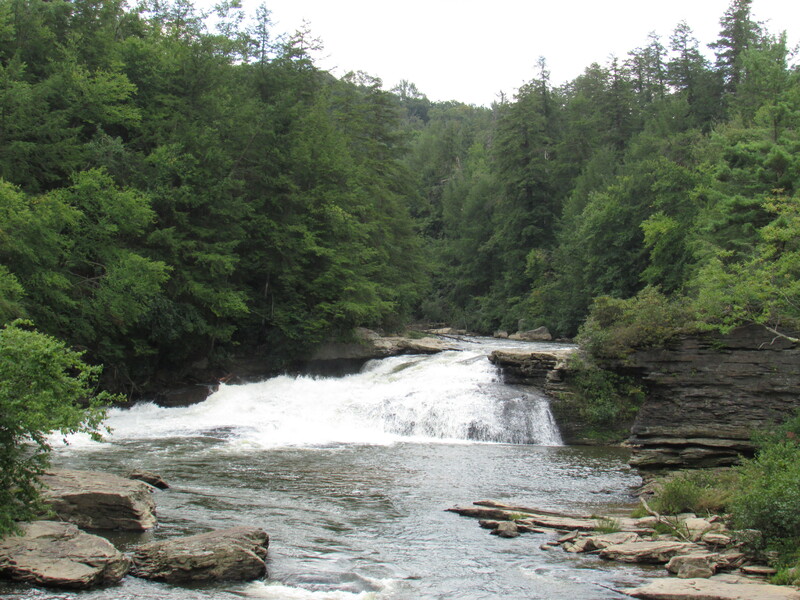 Will future Kentucky teenagers romp through hemlock-shaded valleys? 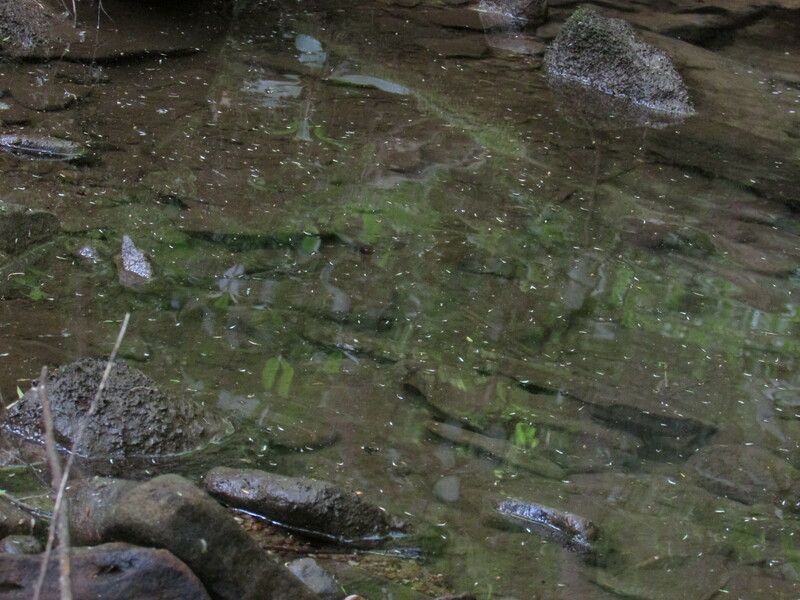 Or will their Gorge hold only skeletons and a few scraggly survivors of the adelgid invasion? The next few years will likely tell. And I hope that in Kentucky, scientists will be able to give this story a different ending.